A team of three Lawrence University students recently completed a rare research opportunity at one of the nation’s premier laboratories in an effort to shed new light on how liquids can solidify. Lawrence physics students Erika Roedl (l.), Leo Sussman (c.) and Ben Clark (r.) recently had the rare opportunity to conduct a five-day experiment at the prestigious Argonne National Laboratory. 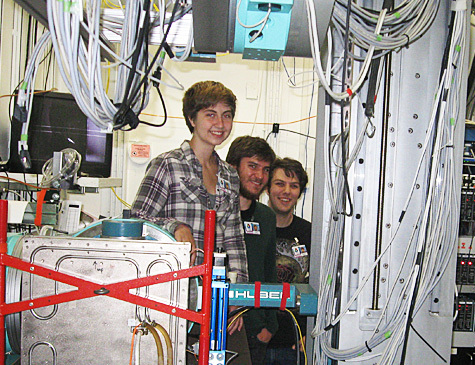 Senior Leo Sussman and juniors Ben Clark and Erika Roedl, under the direction of Nick Mauro, visiting assistant professor of physics, conducted a five-day-long experiment at the Advanced Photon Source (APS) at Argonne National Laboratory in suburban Chicago. The project involved collaborations with students working with Lawrence Assistant Professor of Chemistry Allison Fleshman and a research group at Washington University in St. Louis. The research project focuses on the underlying governing principles that dictate how a liquid forms into a particular kind of solid — glass. Almost any liquid can be formed into a type of glass if cooled quickly enough. The student researchers heated samples of liquids and glasses in advanced furnaces that generate temperatures of nearly 1300 degrees Fahrenheit, allowing them to examine the samples’ atomic structure using extremely bright X-ray beams. structure evolves and how to tailor metallic alloys for particular applications. “My week at Argonne gave me a fantastic glimpse into life as a professional scientist, complete with triumphs and tribulations alike and inspired additional work when we returned,” said Sussman, a physics and flute performance major from San Francisco, Calif. “It was exhilarating when the moment finally came to see the data we’d been preparing to collect for months start to appear on a monitor right before our eyes. The experiments were carried out 24 hours a day with the team working in shifts over the course of five days. More than 60 different experiments using 35 various liquids and glasses were performed. The APS is a state-of-the-art facility that accelerates electrons to nearly the speed of light, creating very intense and highly energetic X-rays. The APS is one of the brightest X-ray sources in the world and researchers from across the globe go there to conduct research in many different fields.